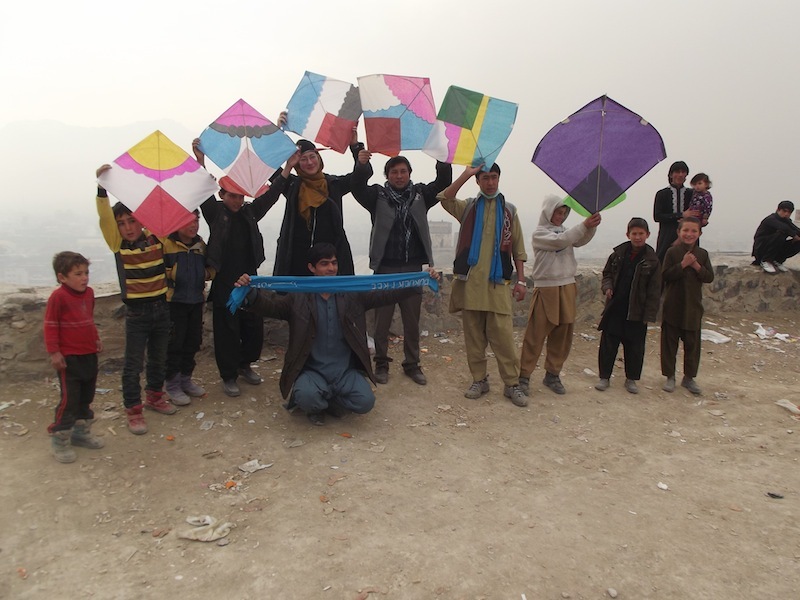 VCNV started the Fly Kites Not Drones campaign to coincide with the Afghan New Year on the 21st March. Inspired by the Afghan peace volunteers and working with Afghans in the UK we came up with the campaign as an act of solidarity with Afghans who live under the constant threat of drones in the sky. We heard reports that children in Afghanistan no longer want to play under the bright blue skies or fly kites because of the threat from drones. Kite flying is a well loved Afghan pursuit which was once banned under the Taliban. For Afghans kite flying represents a freedom. In March 2014 the campaign got off to a flying start with over 30 UK peace groups holding kite making workshops and kite flying days. Kite flying actions also took place in Kabul as well in various locations in the US and a handful of locations across Europe. The concept of the campaign is currently being made into an education resource pack in order for children to learn about and reflect upon what life is like under a drone. Please join us in 2015 to make the campaign even wider.